Anyone familiar with the Shimano brand will know that they offer far more than just fishing rods. Around since the 1920s, the brand dabbles in fishing, cycling, and rowing. In the fishing category, they specialize in reels, rods, clothing, and gear, catering to all your fishing needs. Though there are few words shared on exactly how Shimano got its start, we know that the company got its name from Japanese visionary, Shozaburo Shimano, who was quoted as intending to make the best products in the world. Shimano began his business as Shimano Iron Works, and it wasn’t until the 1950s that Shimano incorporated bicycling equipment. Fishing would join in the 1970s. Shimano is currently based in Sakai, Japan, and has expanded internationally since its start over 90 years ago. Current locations include Asia, Europe, Japan, North American, Oceania, and South America. Shimano rods are categorized into the following groups: freshwater, saltwater, surf, muskie, jigging, inshore, trolling, salmon and steelhead. Their rods are sleek in design and usages are varied for any fishing occasion. With all that attention to detail, it is no wonder that Shimano is a favorite of rod owners, beginners and advanced alike. With the following list of top Shimano rods, you will undoubtedly find ﻿fishing rod﻿ to suit your bill. Shimano’s Solora 2-Piece Spinning Rod should be the rod of choice for any freshwater beginner. The Solora is a fast-action rod that comes in six different models of varying strengths (ultra-light, medium, and medium/heavy). It features the standard Shimano aluminum-oxide guides, cork fore grip, and rear grip handles (both of which hold up well to extreme high and low temperatures), and a solid locking graphite reel seat. The lengths offered range from 5’6” up to 7’0” and are of fiberglass construction. With the shorter, ultra-light rod, you can expect to catch plenty smaller fish. Utilizing the longest rod with the greatest power, you will be reeling in bream, snook, and bass as well. Despite this rods stiffer action, it is still easy to cast and, given its two-piece body construction, is even easier to transport. Due to its fiberglass construction, this rod has decent sensitivity so you can still feel all those soft nibbles, and it will also work well with soft plastics and heavier lures. Despite the Solora 2-Piece Spinning Rod’s lack of a hook-keeper, the rod still performs like a much more expensive rod at a fraction of the price. This modestrod is a superb deal for any beginner. Be prepared to catch plenty of crappies with this one. Shimano’s FXS 2-Piece Spinning Rods are another great option if you’re shopping for a strong, relatively flexible rod that will cast smoothly on a budget. 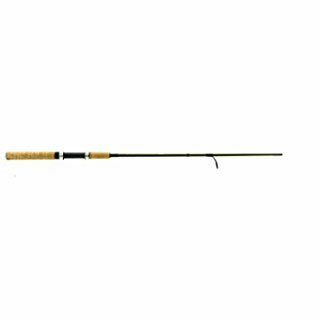 This freshwater rod comes in 10 different models and features Shimano’s aero glass construction, EVA foam-grip, aluminum-oxide guides, and a graphite reel seat. This line has rods that range from 5’ in length up to 9’ and allows you to pair your rod with your choice of varying line and lure ratings. Actions come in ultra-light, medium, and medium-heavy and the rods themselves are incredibly durable considering the cost. For what you can do with this rod, the Shimano FXS 2-Piece Spinning Rod is a bargain buy and has enough backbone and sensitivity for catching those smaller panfish, trout, bass, walleyes, and catfish. Despite this, keep in mind that this rod is not intended for reeling heavier fish in. Additionally, though this rod is meant for spinning, it serves well for casting purposes too. Like the Solora 2-Piece Spinning Rod, this one is also ideal for beginners on a budget. Shimano’s FXS 2-Piece Spinning rods are perfect for travel, as it splits evenly in half and is easy enough to set up. Shimano’s Trevala Casting Rods are an excellent choice if you are looking for a powerful, yet lightweight, castingrod to reel in your medium to large fish. 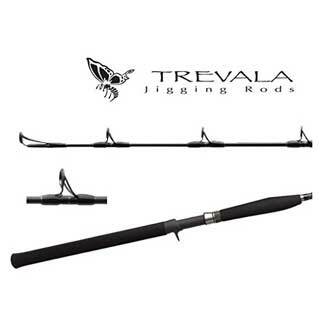 The Trevala Casting rods, intended for saltwater use, are a part of Shimano’s jigging rods and all 13 models come with their custom-shaped EVA foregrip and reargrip and feature two different types of guides depending on which model you get. The heavier rods utilize their Fuji Concept Alconite Guides, whereas their lighter rods use the standard aluminum-oxide guides. The power range on these rods are extremely varied coming in light, medium-light, medium, medium-heavy, heavy, and extra extra heavy. And though it may be hard to believe, the extra extraheavy end of the spectrum holds up beautifully. Most have medium-fast action. The lengths on these casting rods range from 5’8” up to 7’0”. What you end up with are lighter rods that can be utilized alongside higher-power reels. The Trevala Casting Rod comes at a higher price than either the Solora or FXS spinning rods, but in this case, you are getting what you paid for. You will be getting a solid, balanced rod that will hold up to that bigger bass. 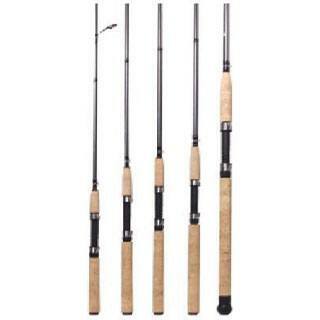 Shimano’s Stimula 2-Piece Spinning Rods are top-of-the-line freshwater spinning rods from Shimano. Unlike the previous rods, the all 12 models of the Stimula spinning rods feature a graphite composite blank rather than the aero glass and also come with custom-shaped cork handles and aluminum-oxide guides. The lengths offered are standard to spinning rods, ranging from 5’6” to 7’0” and are all fast-action rods with the following power selection: ultra-light, medium-light, medium, medium-heavy, and heavy. Spinning rod would also double as an excellent saltwater fish so long as you aren’t fishing for larger stingrays or smaller sharks. It is good for bass, bluegills, catfish, crappies, and panfish that you can find in your favorite lake. With its sleek red body, this rod will serve as an attractive addition to your collection. Shimano’s Sojourn 2-Piece Spinning Rod, a part of Shimano’s freshwater line, is a solid choice if you’re planning on reeling in those larger salmon. The graphite composite rod blank makes it lightweight, durable, and strong, and the cork handles make it an ease to hold all day long.This rod comes in 12 models, ranging in length from 5’ to 7’, are all fast-action, with the following power options: ultra-light, medium-light, medium, and medium-heavy. The low-profile guides and custom reel seat make this rod perform smoothly and cast easily. Like several other Shimano rods, this one splits easily into two pieces, making it another convenient choice for travel. The forward reel style could take some getting used to, but once you do, you will be making beautiful casts with the Sojourn 2-Piece Spinning rod. 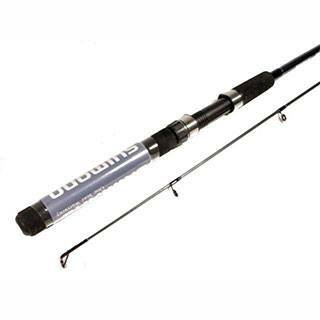 Though slightly pricier than Shimano’s other rods, it’s only what you would expect froma rod of its build and action. If reviewing this list of the top of 5 Shimano rods hasn’t made it clear already, this brand has an excellent selection of affordable, modestrods for any fishing occasion. At the lower end of the spectrum, with the Solora 2-Piece Spinning rod, you have basic spinning rods that will satisfy any novice. For slightly more, the Stimula 2-Piece Spinning rod that will serve any advanced freshwater fisherman well. And if you’re willing to shell out a bit more, the Trevala Casting rod will get you all those larger fish. What also makes many of these Shimano rods even more wonderfulare their convenient 2-piece design. If a Shimano rod fails you within the first year, the company has a couple offerings on how they can make it up to you. Their one-year warranty to will cover any non-conforming, and material and workmanship issues. On a similar note, Shimano also offers rod services that will cover in addition to the one-year warranty; these consist of Shimano Express and the Shimano 30-Day Guarantee. Shimano Express is meant to cover any of those accidental rod breakages and intends to provide you with excellent service as a result. Shimano’s 30-Day Guarantee is based on the theory that any non-conformities or manufacturing issues will show themselves within the first few uses. If any are found, expect Shimano to replace your rod with a few business days. Combine that commitment to customer service with their prices, and what you get are the perfect rods that allow you to fish anytime, anywhere.